Orcanos DMS (document control) allows you to store, manage and track revisions of documents, along with electronic signature. 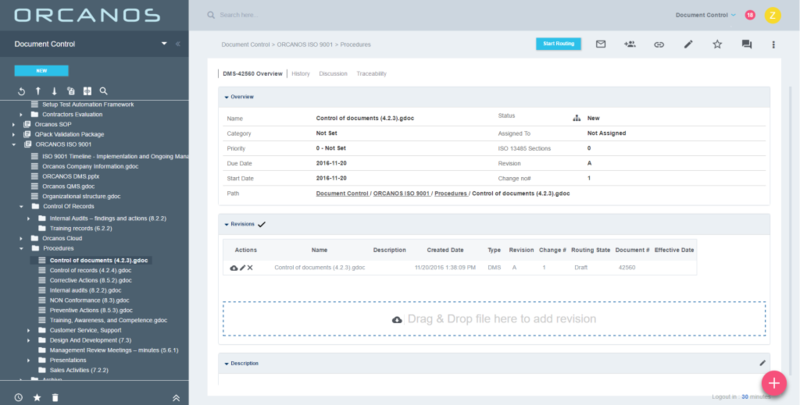 This tutorial will take you through the basic steps required in order to start working with Orcanos Document Control. First step is to analyze existing document structure, before importing. The import action is usually done with a click of a button, after you reorganize files and folders. Rearrange files/ folders as you wish to structure them in ORCANOS DMS database in hierarchic order. In Orcanos Admin, build meta data (custom fields) for the DMS Item, according to your needs. We recommend to manage a custom field for your manual numbering mechanism for future reference, for example, name the field Internal Numbering. We can disregard this field in the future. Build a main workspace – call it QMS, or DMR Master, or any other name you wish. Such topics will holds the files for future referance. Use the import/export tool of Orcanos to import your entire QMS into Orcanos. In order to create a baseline, we will sign all documents (providing that all imported documents are approved/released). This will be our baseline ready to be sighed for the first time using ORCANOS e-sign, we need to do some basic Admin actions. NOTE: Users must be part of the Document Control Project. Change the file name (no need to add revision number, status, or internal number to the file name. system will manage this for you). Remember to change the DMS Item name of that file also to match the same file name you have renamed to. Upload it back by Drag & Drop.